I am heading off to Tokyo, in the middle of winter. Yes, this is me, why do things easy when you can complicate your life by adding freezing temperatures? No, I have not experienced winter or snow, since….. come to think of it it was Japan the last time seven years ago. This will be my first time in Tokyo City and I will (of course) be looking for fabric. Searching in my closet for winter clothing, I came to the realization that I do not have any winter clothing from this decade. Ouchhh! This pattern is from the 90's, Inspired by the movie Flash Dance and worn again in 2007. This decade is almost over and the good thing is fashion just keeps coming back over and over. All you have to do is wait long enough to be able to wear the same clothes again. You can download the pattern for the Batwing Sweater Top from our account at Craftsy. 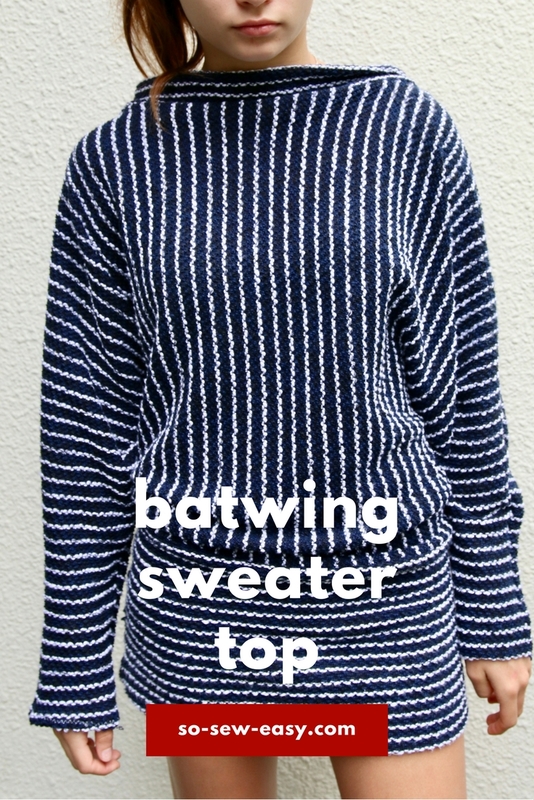 You can sew the batwing sweater top using only a serger if you have one. 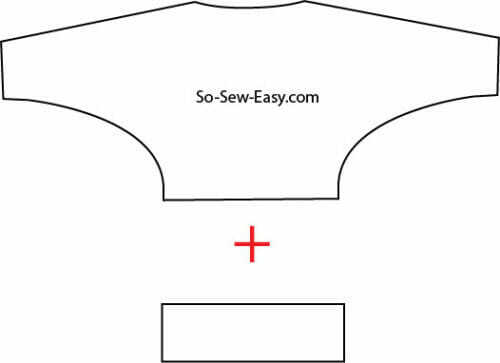 If you don't have one you can use a normal sewing machine but first, do a scrap test, this is a must. You need to find out if the tension, size of the stitch, and the thread quality are correct for your fabric with your sewing machine. 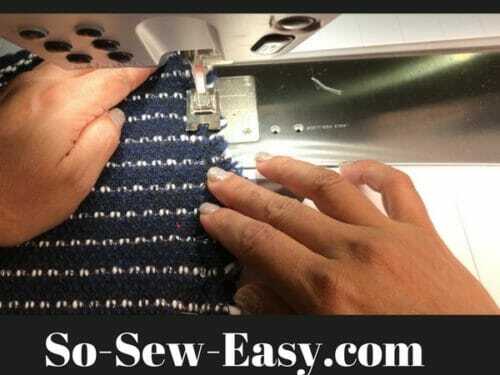 Here are my best tips to navigate sewing a sweater fabric. Decrease the tension, think knit fabrics require less tension than thin knits. Use a Teflon foot (if you have one) on your sewing machine to help the fabric glide easier under the foot. If your fabric is waving at the seams you will have to place a strip of 2″ wide of thin paper under the fabric to help the fabric glide easier. 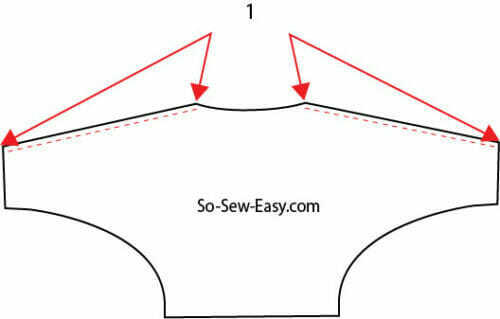 You may find it useful to review this helpful tutorial on Sewing Sweater Knits before you start. 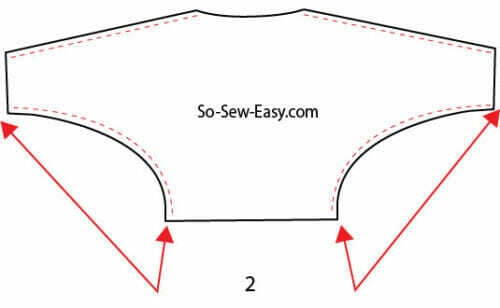 Using a wavy stretchable stitch, or a serger sew the whole project at 3/8″. If your machine has an overcasting stitch, overcast the edge of the fabric to prevent the fabric from raveling. Use a seam reaper to help feed the fabric under the foot. Place the front and back pieces print sides together. Sew at 3/8″. 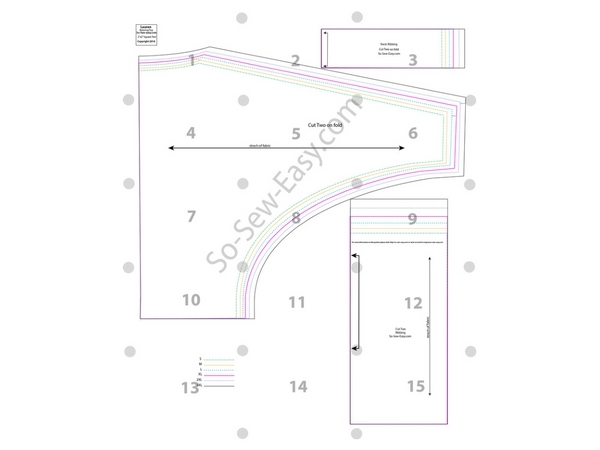 Sew the sides at 3/8″. A great alternative here would be a ribbing fabric in a contrasting color. This would give the top/minidress a hip look. 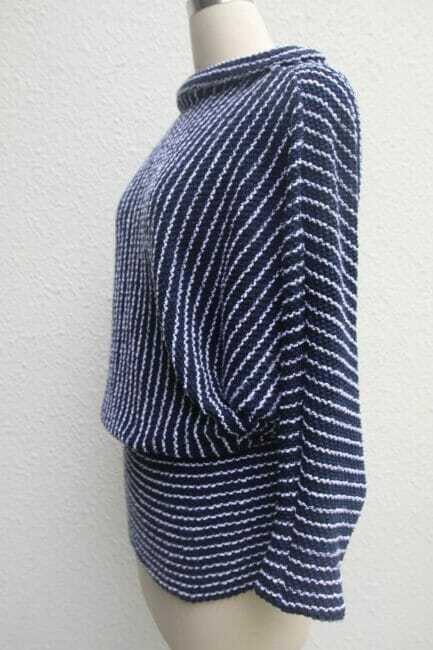 Turn the ribbing print/right side out. Fold the ribbing in half. You should have a band with double layers now. 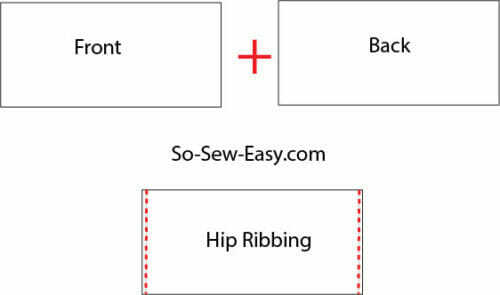 Once you have made the hips ribbing you will sew it to the bottom of the top/mini dress. This is done exactly as the hips ribbing. Sew the strip of fabric prints sides together. 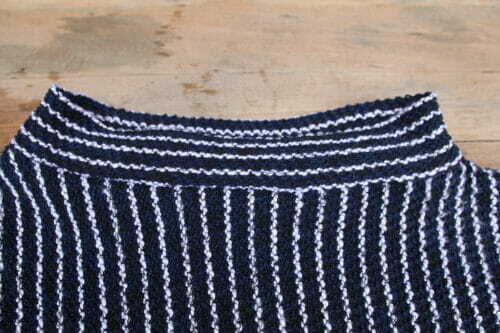 Fold the ribbing lengthwise and sew to the neck area at 3/8″. This is of course optional. You can just serge the neckline and leave it. There are two places where you will serge, at the neckline if you have chosen not to add the ribbing there, and at the wrists. 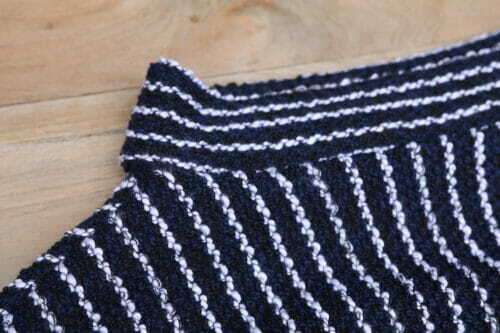 If this finish does not please you turn the hem 3/8″ and stitch with a small zigzag. Wearing this top is easy, stocking, thermal leggings, jeggings and skinny jeans are all perfect choices. 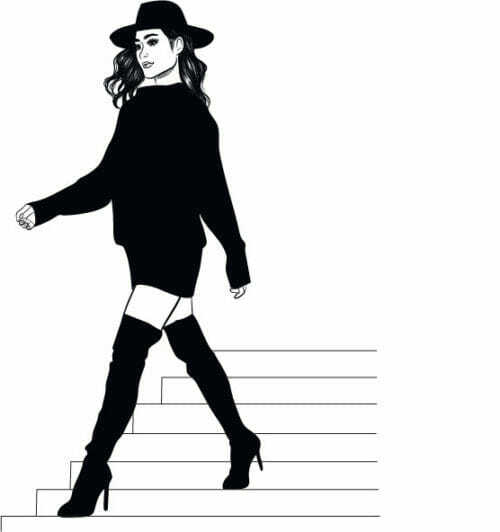 I am missing the hat, the leggings, and the boots. Maybe I will have to rethink this outfit. I better get back to sewing…Until next time! I have a question regarding the width of the pattern. Is it possible that this pattern requires a fabric that is wider than 60″ across? Good question, what size are you looking at, the one on the picture is medium and it does not. Hi, I’m having trouble figuring out the layout. Are the cirlces on the sides of the page meant to meet or overlap? They are suppose to meat and in turn make a circle. Very beautiful! I just cut the pattern and I’m very confused: 1) The neck ribbing (cut two on fold) is bigger than the neck hole (almost double). Is something going wrong or should I must stretch the neck to be same size as the ribbing? 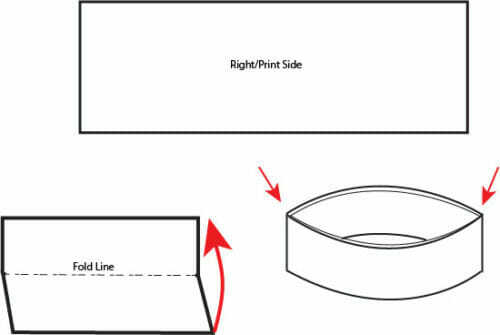 2) The ribbing of the belt (cut two ribbing) must be “on the fold”? Pattern have two arrows but does not write it. Sorry if I don’t understant well. Thank you! Very pretty sweater. Hi Katerin, sorry for the late replay, I have moved houses only a couple of days ago got internet. You need to double the hips ribbing horizontally and vertically. You can see that there is no hem to be made because is double. The neck ribbing is only slightly smaller than the neckline. I will check the pattern I hope I did not mislabel it. Let you know. Also I really like the dress or top worn by the lady in glasses in your welcome photo. Is there a pattern available for this? Re the wrap top, I think you’re right. After I had a look at your link I went to my Craftsy pattern library and I had already downloaded it. Thank you for that, time now to take a break from quilting and start making some clothes. You’re welcome Charlene. Thanks for your comments and happy sewing! I am also missing the hat, the leggings and the boots, as well as the body shape to go with it all, and the cool weather to wear it. I live on the Gold Coast hinterland now, in Queensland, Australia, and I’m thinking it might work it a light cotton knit for days that are a little cooler than usual. I love batwings. I love this sweater and want to make it NOW!!! I will have to drive to Portland Or. where they have so much more fabric to choose from. 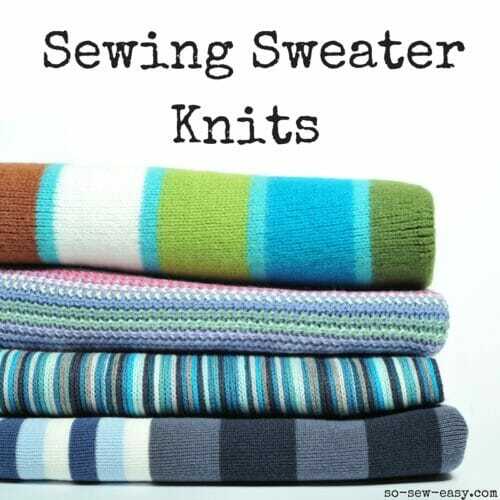 Gas up the car and make a run for some sweater knit fabric. Thanks so much for sharing your patterns with all of us. I have made soooooo many things from your patterns that I can’t even count them all. 🙂 you made my day! Drive safely, please! Let me know what you found. I love shopping for fabric! Cute! Cute! Ah . . so cute! Did I mention that I love this batwing sweater? I for see it in my sewing future. Thank you so much for sharing and enjoy wearing this in Tokyo. Would look good over jeggings, skinny leg jeans or even boot cut jeans. Also if made with a thicker warm fabric could be used instead of a coat or jacket in the spring / autumn. This looks great! Can’t wait to make it. Thanks so much for all these free patterns.